I am so excited to be sharing this post today with you! 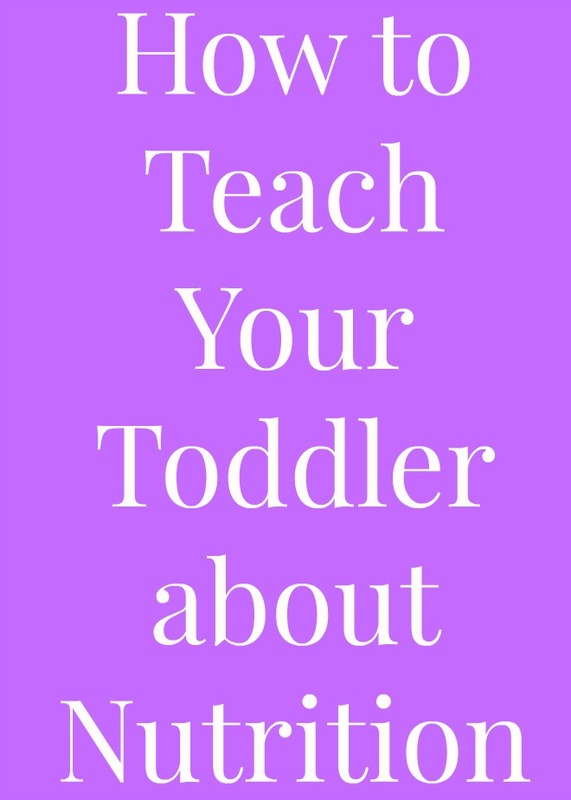 It could easily be part 1 of a 10 part series because there is so much to talk about when it comes to teaching your toddler and kids about nutrition. As a dietitian, even before I had children, I knew how important it would be to me to teach my kids about nutrition one day. I remember being at Troy's cousin's house when they were just three years old and they knew that there was vitamin C in orange juice. I was seriously impressed and knew that I wanted to teach my kids all about nutrition when they were the right age. Today, I want to share some of the things that we are doing to teach Adalyn about nutrition and living a healthy lifestyle. Adalyn threw a bunch of chia seeds into her blueberry yogurt! I have so much fun in the kitchen with Adalyn sometimes! When making a smoothie, I have her grab a big handful of greens to put in the smoothie, pour in the milk and add in the fruit. I think that visually seeing produce and getting excited about it is so important in encouraging kids to want to eat healthy. She also helps to put "chia sprinkles" AKA chia seeds on her yogurt, sets out our silverware on the table and more. I'm sure that we will start cooking together more and more as she gets a little bit older. This is my favorite part of teaching Adalyn about nutrition. During a meal, I tell her that chicken has protein that helps make us strong. I tell her that drinking milk gives us strong bones. I tell her that eating lots of vegetables helps prevent us from getting sick. I keep things super basic so that she understands what I am saying and it has worked. She can repeat all of these things if you ask her what different foods do for you. She knows that fish helps your brain health. Funny story, my dad was recently in the hospital (he is okay now!) and my daughter told him that he has to eat his veggies like broccoli, kale, carrots and more to get better. So cute!! I am the proudest dietitian mama. Also, my sister's boyfriend ran a race back in October and felt sick after it. My daughter is convinced that the reason is because he didn't eat enough veggies!! Hearing my daughter understand and learn about nutrition is one of the happiest things in the world to me. I do a lot of my grocery shopping during my lunch hour at work but when Adalyn does come with me to our local produce market, I get her pumped up before we go and tell her about of the delicious produce that we are going to see. Then, I let her choose fruits and vegetables that she wants to try. Recently, I told her that I was going to the grocery store and asked her if there was anything that she wanted me to get. She told me "carrots, bananas, broccoli, peaches and green beans". I picked up all of the items that I could find from her list. She was thrilled. A big part of getting kids to eat healthy is to get them excited about nutritious foods. Ice cream is okay on occasion! The number one thing that I am scared about raising a daughter is giving her body insecurity issues. I make sure to never talk about my weight around her. I would never say that a certain food would make you fat or anything like that. I let her eat candy, chips, cake, cookies, etc. but obviously only on occasion. I never want her to be restricted and then go crazy eating a bunch of junk. The one thing that we do say is that if you eat too much candy/cake/etc., you may feel junky. We talk about feeling good but never about weight. She has stepped on our scale a couple of times and I tell her "your weight says that you are perfect" and leave it at that. With hearing all of the scary statistics about children, dieting and eating disorders, I want to raise her in an environment where all of these issues are limited as much as possible. Adalyn's number one favorite thing to do each day is to take her vitamins. Seriously! She asks me all through the day to take her vitamins until she gets them (usually after dinner). We alternate by taking a probiotic, omega-3 fatty acids (which she calls her fishy vitamins) and a multi-vitamin. Taking vitamins is so fun! We love the vitamins from Smarty Pants. Adalyn takes the Smarty Pants Kids Complete gummy vitamins and the Kids Complete Probiotic gummies. She enjoys the taste and knows that the probiotics are for a "healthy belly". Teaching Adalyn about vitamins and then associating them with what food that nutrient is in helps her to learn and understand nutrition. Then when she eats yogurt, she can understand that probiotics are in the yogurt like in her beloved purple vitamins. When she drinks her smoothie, she can learn that there are naturally occurring vitamins in there like in her gummy vitamins that she gets to take. Each day, she also reminds me to take my prenatal vitamin (I am horrible about remembering!) and she tells me "Mommy, you get one vitamin and I get two vitamins". She is correct! The Smarty Pants probiotics contain multi-strain probiotics and prebiotic immune support. The forms of probiotics that they contain are in spore form which can stand up over time, different temperatures and harsh stomach acids. These probiotics are beneficial for digestive and immune health. They are made with organic and fair trade sweeteners, are vegetarian, have no artificial colors, flavors, or preservatives and are gluten-free and allergen-free. Disclosure: This post is sponsored by Smarty Pants. Thanks for supporting the brands that make The Nutritionist Reviews possible!